I wrote the following reflections on the way home from SPBGMA 2017. This Bluegrass showcase and award show attracts bands and fans from the heartland of America. Music City Sheraton in Nashville has been the home for this annual pilgrimage for many years. Having lost its leader, Chuck Stearman last year, the event continues to offer opportunities to jam with great players, try out instruments and reunite with old friends. For me, it has been a great place to meet and help people with setup and repair which led to my role as official workshop presenter this year with Jack Hatfield’s SPBGMA banjo clinic. Jack has organized the SPBGMA workshops for years and always provides a great value by bringing in the top teachers and talented players to share their skills with the rest of us. 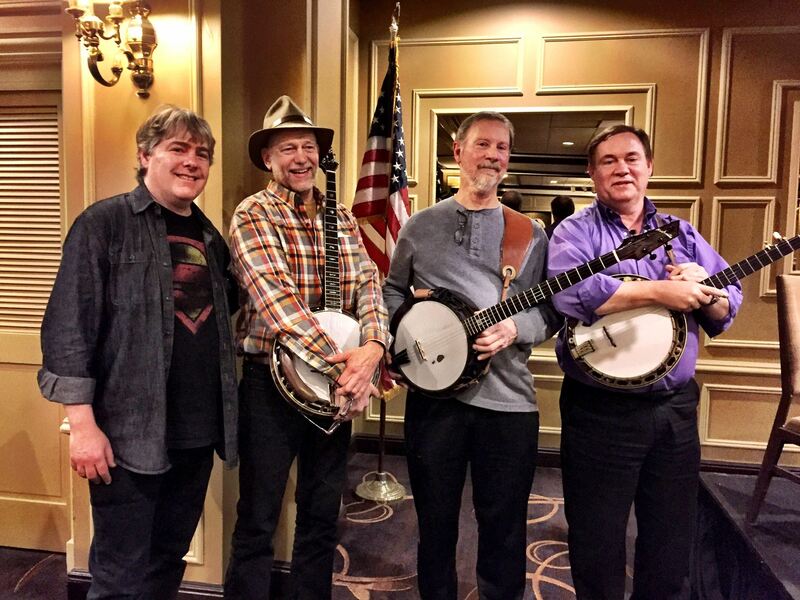 2017 marked a banner year for the SPBGMA workshops; the world’s most renowned banjo player came and graciously delivered well thought out ideas tailored especially for the Bluegrass participants. As a musician dedicated to improving the status of our beloved instrument, my hat goes off to anyone who goes out of their way to do the same. That basically means I am thanking guys like Jack; festival and workshop coordinators, teachers, performers, jam hosts, philanthropists, our banjo customers and students. As small as the banjo world is, it is filled with a huge percentage of passionate friends who are helping the raise the awareness and stature of America’s instrument. I care about this partly because it is good for business to spread awareness of the banjo, but mostly because banjo is fun, cool and healthy for people. Famous people who comment on the banjo either perpetuate the instrument’s backward stereotype or they can educate the public on its merits. Listen to Steve Martin’s interview with Johnny Bair from the banjo museum for example. Steve articulately describes his reasons for playing and loving the banjo. We can use more advocates with the recognition power of Steve Martin telling the benefits of banjo to our world. We all can imagine the implications if the masses started playing music, and particularly banjos. So in the spirit of expansion of banjo awareness, I am thanking everyone in the banjo world for your support and participation. The more recognized you are in your sphere of influence, the more potent is your message. Here I focus my accolade to the banjo community by singling out three respected individuals who each have very different stories, but came together at that moment SPBGMA workshop in the spirit of advancing universal banjo camaraderie. As mentioned, Jack is a tireless advocate of the banjo and probably the worlds most prolific author of banjo instructional books. His mind is always fixed on ways he can help students of the banjo improve themselves. Jack lives to play and works hard just so he can facilitate the sharing of banjo knowledge and skill. I was heart broken to see and hear of the fire that stole Jack’s business and life’s possessions. His inventory of instruments, storehouse of books and accessories were completely lost during the recent wildfires that swept through Pigeon Forge Tennessee. As workshop coordinator, Jack’s misfortune did not diminish his effectiveness this year. Quite the contrary. Jack pulled together a world class teaching roster and prepared a day of banjo learning that I will not forget. His own teaching style is straightforward and always emphasizes the right sequence of learning which I think is of utmost importance. I first encountered James McKinney at Nashville’s Station Inn in 1990. He was the banjo king of the Sunday night Bluegrass jam. As a newcomer hearing the power of James’s exuberant playing pretty much froze me into an amazed stupor. It was a year later and I was practicing in my IBMA hotel room when I was challenged by the familiar strum of Dueling Banjos from the balcony above my room. I cautiously replied, “strum-strum-strum-strum-strum“. When we reached the fast part, I recognized the insanely brilliant flurry of notes that James is famous for. Over the years since, we have judged banjo contests, taught side by side and even followed each other on the stage of Jack’s Smoky Mountain Banjo Academy concert. James is chock full of musical and technical knowledge relating to banjo and is a great instructor. I personally have benefited from James’s clear teaching, jamming and great stories told when relaxing. As Jack tells me, James is the one banjo teacher that everybody can learn from. James is dedicated to advancing the state of banjo playing and expanding the voice of the banjo in bluegrass and acoustic music. Hats off to James who teaches that hard work in the spirit of fun and self improvement really pays off. The music of the 5 string banjo is rooted in the hills of Appalachia where both James and Jack come from. Both are passionate about Bluegrass and at the same time share the vision of an expanding role for the banjo in all kinds of music. This is our common thread. It runs to Minnesota where instruments are made with an eye on the future and to New York where the passion of hearing “that sound” across a spectrum of music describes an individual whom this article is about. Bela, having dedicated his life to a vision we all share, continually remembers and respects the roots of the music and the musicians growing from them. What deeper gesture of respect is there than to take time to come to the most traditionally minded music event in the country to reinforce that bridge between tradition and creativity? Bela Fleck was way cool in his approach of treating the primarily traditional Scruggs based players as we are all in the same boat, (although we really know who the captain is). Bela used simple Scruggs rolls and basic fingerings to unravel some very characteristic aspects of his Bluegrass playing. He gave us all insight about his own musical journey and showed examples of how he might practice as to make it not so boring. He revealed ideas and thoughts and little discoveries that inspired him along the way, and explained them all without the need for fancy chord names or technical terminology. He was prepared with worksheets and it was evident that he had given the challenge of teaching his style to intermediate players a lot of thought. As Bela’s legacy continues to unfold, I am so gratified to see him delivering such an inclusive and welcoming presentation to the Bluegrass banjo community. In addition to, his role as world-class composer and virtuoso, it is so great to know that we share the same love of the instrument and the players sprouting form its roots. Well done workshop Jack. Thanks to all my setup participants. Bluegrass is definitely better off because of Jack, James, Bela and you. Hats off all you guys and gals!